Feds released this photo of a suitcase stuffed with cash allegedly stolen from ATMs via hacked international bank accounts. Most of the money is still missing. Federal prosecutors charged six more defendants on Monday in a $45 million dollar cybercrime case that allegedly involves a suitcase stuffed with cash, cleaned-out ATMs, champagne bottle service and a murdered ringleader. Loretta Lynch, U.S. Attorney for the Eastern District of New York, charged the six defendants -- Anthony Diaz, Saul Franjul, Saul Genao, Jaindhi Polanco, Jose Angeley Valerio and Franklyn Ferreira -- with hacking into global financial institutions and stealing millions of dollars. Eight other defendants were previously charged in the cyberheist. Prosecutors released photos of some of the suspects, who allegedly posted pictures of themselves on Facebook (FB) partying with champagne bought with pilfered cash. Five of the six men were arrested in Yonkers, N.Y., and are scheduled for arraignment Monday in Brooklyn federal court before Judge Robert Levy. Ferreira fled after learning his friends were arrested and remains a fugitive, according to officials. Franjul has retained a lawyer, Andres Aranda, who did not immediately return a phone message from CNNMoney. Altogether, 14 defendants have been accused of participating in the cybercrime ring, which used sophisticated techniques to hack into international banks, steal debit card account information, and withdraw unlimited amounts of cash from ATMs worldwide, the prosecutors said. They said that the New York cell withdrew about $2.8 million in a matter of hours. It's the second largest theft on record in New York City, surpassed only by the 1978 Lufthansa heist made famous in the movie "Goodfellas." Prosecutors released photos of the suspects partying with buckets of champagne in a Manhattan bar called South Beach. A receipt from South Beach, dated from March 17, tallied their purchase of $4,138 worth of Don Perignon, Chivas Regal and other beverages. Staffers at South Beach were unavailable for comment. The government also released photos of a suitcase stuffed with $800,000 in allegedly stolen cash. The alleged ringleader, Alberto Yusi Lajud-Peña, was murdered in the Dominican Republic, where the New York-based defendants are originally from, according to prosecutors. 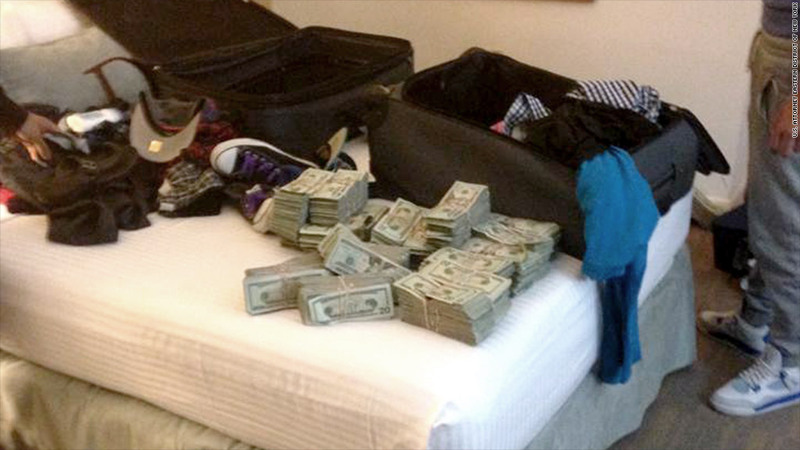 Some $100,000 from the cash-packed suitcase was found in his home, but the rest of the cash is still missing, they said.